The euro's 15% drop against the dollar this year has made European goods more competitive abroad. ZURICH (Bloomberg) -- European confidence in the economic outlook unexpectedly improved in June after reviving global growth and a drop in the euro bolstered the region's recovery. 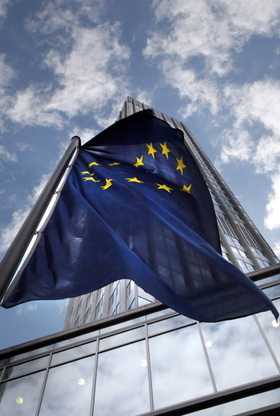 An index of executive and consumer sentiment in the 16 euro nations rose to 98.7 from 98.4 in May, the European Commission in Brussels said today. Economists had projected a drop to 98.1, according to the median of 25 estimates in a Bloomberg News survey. The commission's index is based on a survey of 130,000 managers and 40,000 consumers conducted in the first two weeks of the month. The euro's 15 percent drop against the dollar this year has made European goods more competitive abroad as the global recovery gathered strength. While Volkswagen AG's Audi luxury unit, BMW AG and Daimler AG's Mercedes-Benz division are among companies stepping up output, the Greek debt crisis has eroded investor confidence and forced governments to cut deficits. German investor confidence plunged in June.